The value of fasting consists not in abstinence only from food, but in a renouncing of sinful practices. Do you fast? Give me proof of it by your works. If you see a poor man, take pity on him! If you see a friend being honored, do not envy him. Do not let only your mouth fast, but also the eye and the ear and the feet and the hands and all members of your bodies. Let the hands fast, by being free from greed. Let the feet fast, by ceasing to run after sin. Let the eyes fast, by observing modesty and disciplining them not to glare at that which is sinful. For it would be an instance of the highest ridiculousness to abstain from meats and unlawful food because of the fast, but with the eyes to feed on what is forbidden. Let the ear fast, by not listening to evil talk and gossip. Let the mouth fast from foul words and unjust criticism. For what good is it if we abstain from birds and fish, and yet bite and devour our brothers? Reflection: When we consider the notion of the final judgement when we shall stand before God to account for our lives, we can easily think that what God will look at is the quality of our religious observance, our prayer and asceticism, how faithful we were attending church and the like. Such thinking is misguided. What does it mean to be a Christian, a follower of Christ? The stichera today remind us of our life in Christ in the holy sacramental mysteries. We anoint ourselves, when chrismated with “the seal of the gift of the Holy Spirit,” but this means virtue. We are baptized, washed with the consecrated water, but it is the water of purity. We are partakers of the Lamb of God, we partake of the sacrifice, we partake of the resurrection, but this is “the brightness of virtue and the goodness of our deeds.” Yes! We need to fast, to deny ourselves, but the fasting itself is not the goal, but our transformation by God’s love into a people that is holy and pure and good. 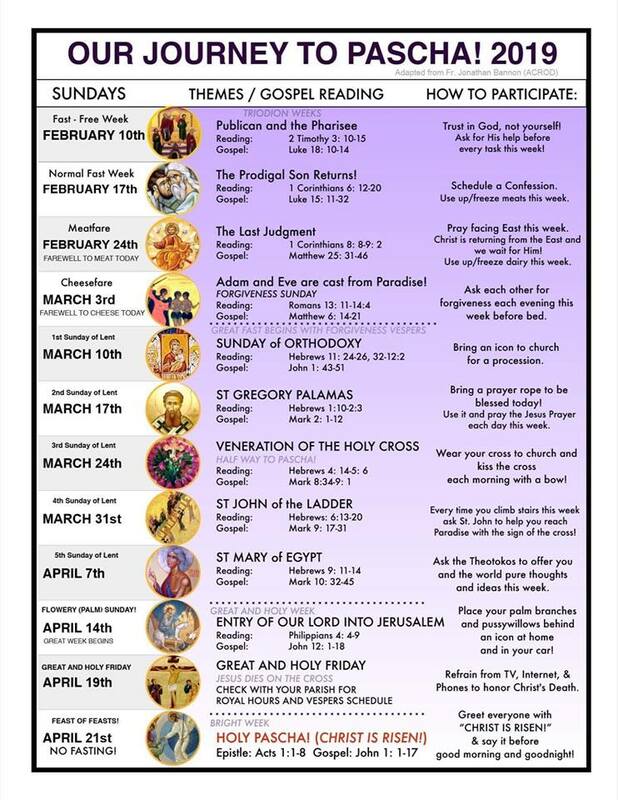 The Church sets aside the next forty days as a period of prayer and penance as a preparation for the Great and Holy Week and the resurrection of our Lord. There are rules about fasting, which we must observe as faithful Christians. However, we must not mistake the true meaning of the Fast. 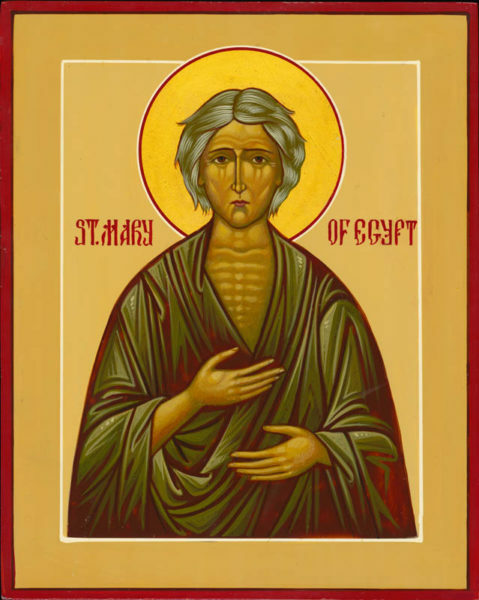 The fast is, truly, a period of spiritual ascesis (struggle), as today’s Gospel tells, us, “Do not store up for yourselves treasures on earth … But store up treasures in heaven” (Matthew 6:19-20). However, it is not like school, where we keep all the class rules and earn gold stars for our obedience. Today’s epistle tells us that the Fast is not about “keeping rules:” “The one who eats must not despise the one who abstains, and the one who abstains must not pass judgment on the one who eats; for God has welcomed him” (Romans 14:3). Yes, we do keep the rules, but we must also transcend the rules. The Great Fast is not a period of earning merit points, which leads to pride anyway, but it is a time for a spiritual revolution in our lives. We must turn the values of the world: love for power, love of money, love of pleasure, and self-serving upside down. 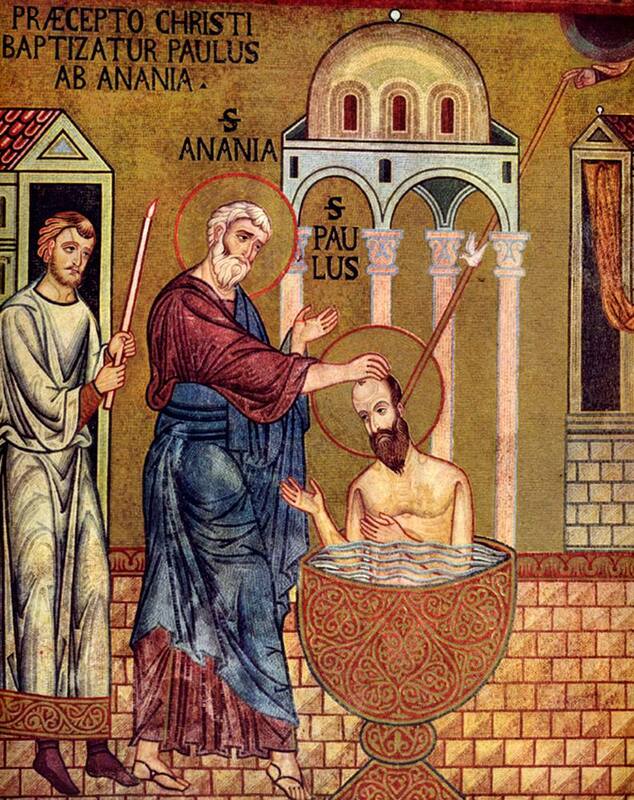 In our baptism, we promised to renounce “Satan, and all his works, and all his angels and all his service, and all his pride,” and to commit ourselves to Christ. This is especially true in a world which polarizes us into self-righteousness and teaches us hatred for the other. Why, indeed, do we fast? It is to bring about this revolution, foretold by Mary, the Mother of God, “[God] has thrown down the rulers from their thrones but lifted up the lowly. The hungry he has filled with good things; the rich he has sent away empty” Luke 1:52-53). We must become the humble, the lowly, the hungry and reject the world’s lust for power. In the Great Fast, then, we live out the Lord’s Prayer: “Thy Kingdom come, thy will be done on earth as it is in heaven,” not our own plan for salvation, but God’s plan, God’s will, seen in love for the other, “Give us this day our daily bread,” for we fast from the delightful food of this world, to receive only Christ, who said, “I am the bread of life (John 6:48);” “forgive us our trespasses, as we forgive those who trespass against us,” in unconditional forgiveness, as today’s Gospel reveals, “If you forgive others their transgressions, your heavenly Father will forgive you. But if you do not forgive others, neither will your Father forgive your transgressions (Matthew 6:14-15), and finally, “lead us not into temptation, but deliver us from evil,” for if in the Fast we imitate Jesus, who fasted in the desert for forty days to overcome temptation, then we too will be delivered from evil, but not by our own proud struggles, but by the grace of God. In this fast, we must open ourselves to Christ, who said, “Behold, I make all things new” (Revelation 21:5). 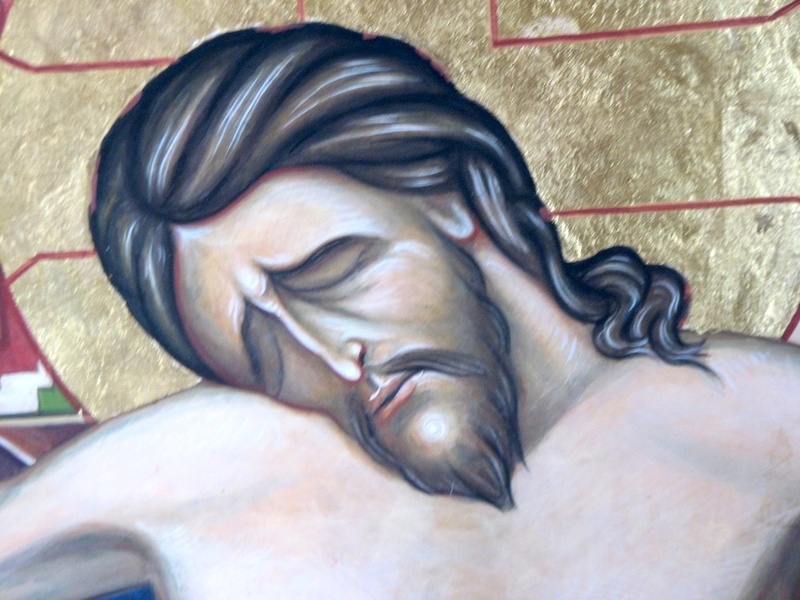 By the threefold discipline of fasting, prayer and almsgiving the Church keeps the Great Fast/Lent from Monday, March 4 (March 11 – Julian Calendar), after the Cheesefare Sunday to the day before Easter, Holy Saturday, April 20 (April 27 – Julian Calendar). ~Abstinence from meat and dairy products on The First Day of the Great Fast, March 4 (March 11), and on Good Friday, April 19 (April 26). ~Abstinence from meat is to be observed on all Fridays and the Great Fast. ~Abstinence from meat is suggested and encouraged on all Wednesdays of the Great Fast. Note: The following are exempt from abstinence: 1. the poor who live on alms; 2. the sick and frail; 3. Convalescents who are returning to their strength; 4. pregnant women and women who are nursing their children; and, 5. persons who perform hard labor. Meat is to be understood as including not only the flesh, but also those parts of warm-blooded animals that cannot be rendered, i.e., melted down, e.g., the liver, lungs, etc. meat gravy or soup made from meat is included in this prohibition. Dairy products are to be understood as comprising products derived from mammals and birds, but not regarded as meat, e.g., cheese, lard, butter, milk, eggs, etc. A fast of one hour from food (prior to service starting time) should be kept those receiving the Eucharist at the evening celebration of the Divine Liturgy of the Pre-sanctified Gifts, as well as the Divine Liturgy of St. John Chrysostom and St. Basil the Great.